Just after California Governor Gavin Newsom delivered a fiery inauguration speech that positioned the state firmly against the worst elements of the Trump administration, the president swiped back via his favorite medium: Twitter and empty threats. Trump claimed that he told FEMA to “send no more money” to the state, which is recovering from the worst wildfires in its history; 2018 was a hot, dry, deadly and scorched year. But the president’s hatred for California isn’t new. And, more broadly, conservatives make a point of regularly sniping at the state and “San Francisco values” — whatever that’s supposed to mean. While California does tend to go Democratic in election years, it contains deeply conservative pockets. In a bitter twist, many of those rural California counties are also hardest hit by wildfires, thanks to quirks of geography. 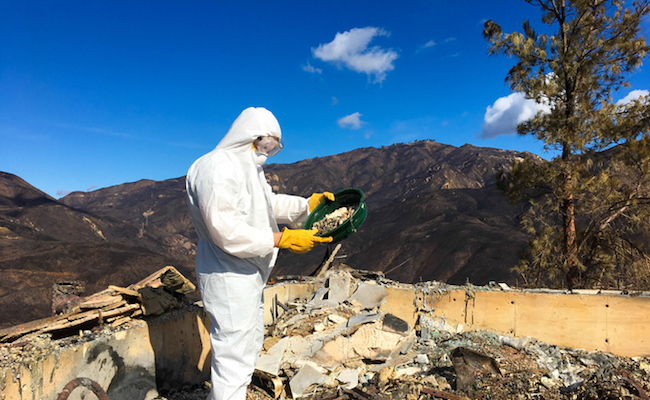 People who lost homes and loved ones in 2018 and during 2017′s terrible wildfire season may well have voted for Trump and counted themselves among his supporters — but now he’s willing to treat them as collateral damage in his war with the Golden State. Take action: Join Care2 members calling on Trump to leave California’s FEMA funding intact. Trump has battled with California over wildfires for months now, trying to claim that the state’s forest management is responsible for its frequent and devastating fires. There are a few problems with that assertion — beginning with the fact that many fires start on federal land, which is not under state control. Wildfires also thrive in scrubland, not forests. Newsom has made addressing wildfire risk a priority from day one — and that includes restoring gutted federal funds for, you guessed it, timber management. Trump’s tweet — well, tweets, actually; he spelled “forest” as “forrest” the first time and had to redo it – appears to be the next salvo, and it’s a very troubling one. As the country’s leader, Trump can theoretically direct a government agency to perform any number of tasks. So can Congress, which could insist on locking down funds to help California recover and invest in disaster preparedness. It should be noted that tax revenue from California contributes significantly to federal coffers, especially with the changes to the state and local tax deduction. Trump seems to be suggesting that states not loyal to him cannot expect federal aid in the aftermath of disasters, which is truly repugnant. You shouldn’t have to sign a loyalty oath to get the support of the federal government, as this is what the federal government is for. His remarks are also a violation of the collective agreement that is the United States. California, like other states, contributes taxes, goods and services to the union in the interest of the greater good. Not needing to maintain a standing army, for example, is a significant cost savings for California. Meanwhile, poorer states benefit from federal investments made with California dollars. It makes sense to pool resources for activities that can be conducted on a federal level. Disaster response is one of those — and if Trump wants to punish California, which state will be in his sights next? Should all blue states fear that federal aid will be curtailed or withdrawn when the worst happens and they reach out for help? And if the federal government cannot uphold its part of this relationship, why should California continue to contribute federal taxes, or remain in the union at all? I’m not advocating for secession or a tax strike here, to be clear, but Trump seems to believe he can threaten California without retribution — and he might be surprised by the outcome. Care2 members say Trump should leave California’s aid alone and direct federal agencies to work with state officials on wildfire mitigation. Join them by signing this Care2 petition! Trump is a monster, lacking in empathy and humanity. Maybe the environmental genius is punishing Californians for not "raking the forest floors" to prevent forest fires. As he's bragged countless times, he knows more about everything there is to know than anyone else. According to YaleEnironment360, "California plays an incredibly important role as a pathfinder that plots out the course for the energy transition, climate change, and the environment in general," said Jules Kortenhorst, the CEO of the Rocky Mountain Institute, a Colorado-based energy think tank. All this puts the state on a collision course with President Donald J. Trump, who has made clear through his statements and appointments that he is ready to disregard the threat of climate change and stress fossil fuels as a path to robust economic growth. In response, California's leaders, all Democrats, have expressed defiance." And after screwing over Puerto Rico, he's threatening to cut off their funding, too. But we have to build that wall! What a petty, vengeful and worthless leader he is! It is astounding the trouble one petty, petulant, sociopathic moron can do. I don't understand how anyone can believe or trust him. He's a devil. Uncle Sam adhi: Nirvana, 911.